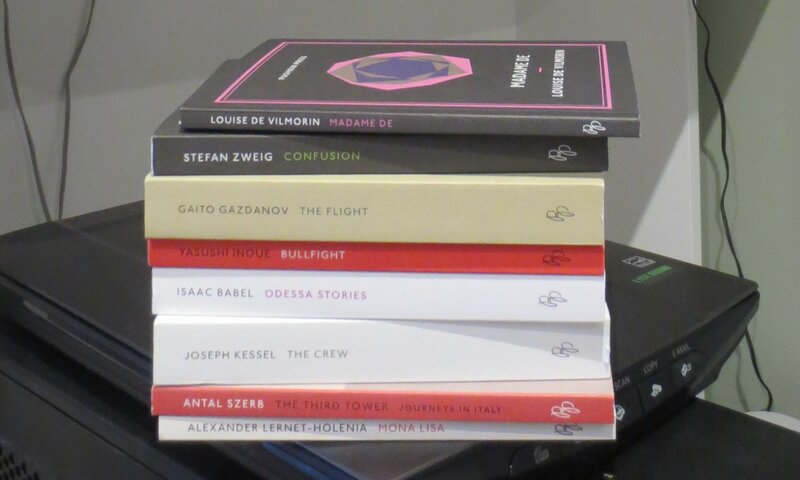 It’s Pushkin Press Fortnight at Winston’s Dad, and I was spoiled for choice since I had finally succumbed to his enticing reviews and bought an annual subscription to Pushkin Press. (I’m not sure that you can still do this. I couldn’t find the link on their website if you can). I was tempted by Odessa Stories by Isaac Babel because I am currently reading Children of the Arbat by Anatoli Rybakov which has once again whetted my appetite for RussianLit, but in the end I decided to start with the book I’ve had the longest, Madame De by Louise de Vilmorin. It’s only 80 pages long, more of a short story than a novella, which is a good thing since Children of the Arbat is over 700 pages and I am only half way through. Madame De piques the interest immediately with its strange title. Although it was first published in 1951, the omission of the proper noun and its replacement with a blank space alerts readers to a device used to hint at a real-life subject (i.e. a roman à clef) while at the same time suggesting a universal type. Madame De could actually be someone the reader knows (or knows of) but she could also be ‘a typical woman’. Either way, it is hard to escape the conclusion that the author despised Madame De . The characterisation is much kinder to her husband. 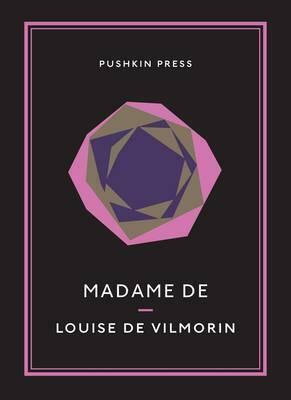 I like to think that De Vilmorin set her tale in the past and wrote in the style of 19th century French fiction because she was pleased that women such as Madame De no longer existed. I have recently bought Les Parisiennes: How the Women of Paris Lived, Loved and Died in the 1940s by Anne Sebba and although I’ve only read a couple of chapters, the book shows that reality of life under Nazi Occupation meant that there were grave risks for weak-willed women dependent on men for their sense of self. Then again, the 21st century is replete with celebrity airheads who marry foolish rich men, and maybe De Vilmorin was satirising the behaviour of collaborators. An idle woman with no children, Madame De is preoccupied with being elegant because that is the mark of merit in the circle of society to which Mme De belonged. She sets the fashion and others follow. Balzac wrote many stories about women such as her, often in contrast to women who used their wit and intelligence to achieve something worthwhile despite the patriarchal society they lived in. The 19th century being as it was, Madame De has no money of her own so through her own folly she ends up embarrassed by her debts. She decides to sell some very valuable heart-shaped diamond earrings which M. de had given her as a wedding present. She puts on a stellar performance when she ‘discovers’ they are missing. The story traces the adventures of these earrings as they are first subject of speculation as to the thief, then a cause of anxiety to the jeweller who has legitimately bought them but now fears being accused of being a fence, then purchased again and again and again by the amused husband while his wife engages in subterfuge with the Ambassador who buys the earrings as a token of his passion for Madame De . As in all good fairy tales Madame De gets what she deserves, but there is more to the tale than a morality tale about vanity, deceit, trust, self-delusion and folly. The earrings, once a symbol of love, are tarnished by lies that inevitably impact on all the relationships in the novel. No one comes out of it well, not even the rational and tolerant husband. I think this book featured in reviews for Women In Translation month, but I can’t remember where I first heard of it. Available from Fishpond: Madame De. (For Australian and New Zealand buyers, it is cheaper to buy individual titles from FP than the Pushkin Press website because you don’t have to pay postage). I love it that the husband kept secretly re-buying the diamonds. Whatever we might wish, women don’t always feel they are in an equal relationship and concealing things gives them the illusion of power. Particularly the case where women have had abusive fathers, in my wide experience. Yes, an illusion. But I found it hard to have much sympathy for this woman. I liked this one a lot, Lisa. A perfect example of the sort of titles Pushkin offers. Yes, I really like their little books. They are so beautifully presented and the stories are always perfect little gems to provoke thought.